Home Forward is a public corporation with the ability to function like a private real estate developer. We strive to invest wisely and achieve the greatest public benefit. Home Forward’s experienced development team undertakes a wide range of activity, including major property development, property acquisition and remodeling, and capital improvements for our existing properties. We focus our development efforts on creating rental housing to serve the lowest-income households in our region. Go to our 85 Stories web page to learn more about our plans to renovate 10 apartment communities that provide seniors and persons with disabilities with deeply subsidized homes. 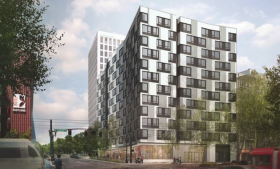 Home Forward is constructing the largest affordable housing building developed in Multnomah County in over 50 years. Home Forward partnered with Catholic Charities and St. Francis of Assisi Parish on an affordable housing community located in a rapidly gentrifying area of inner Southeast Portland. Construction is nearly complete on a completely new, accessible and sustainable apartment community to replace the isolated 1968 Hillsdale Terrace public housing community in southwest Portland’s Multnomah neighborhood. Home Forward partnered with non-profit LifeWorks NW on a development in Northeast Portland that provides permanent apartment homes with supportive services and expands a culturally-focused residential treatment program, Project Network. In 2009, Home Forward added a public housing subsidy to 25 units in this affordable housing community in Gresham and made improvements to the property. This historic Portland landmark served as a low-income residential hotel since it was built in 1907. Over one hundred years later, Home Forward completed a renovation that brought it up to code and returned it to safe and decent service. Humboldt Gardens is a groundbreaking green community of townhomes, flats, and apartments built around a central pocket park in North Portland. This award-winning mixed-income apartment community in downtown Portland resulted from an innovative public-private partnership between Home Forward and Gerding Edlen Development. New Columbia is a diverse 82-acre neighborhood built on the former site of World War II public housing for defense workers, with the help of Home Forward’s first HOPE VI federal grant.